Alright, her name is Daisy Cowit. Yes, Daisy Cowit, so let's just get that out of the way right now. She's 21, and this just happened. 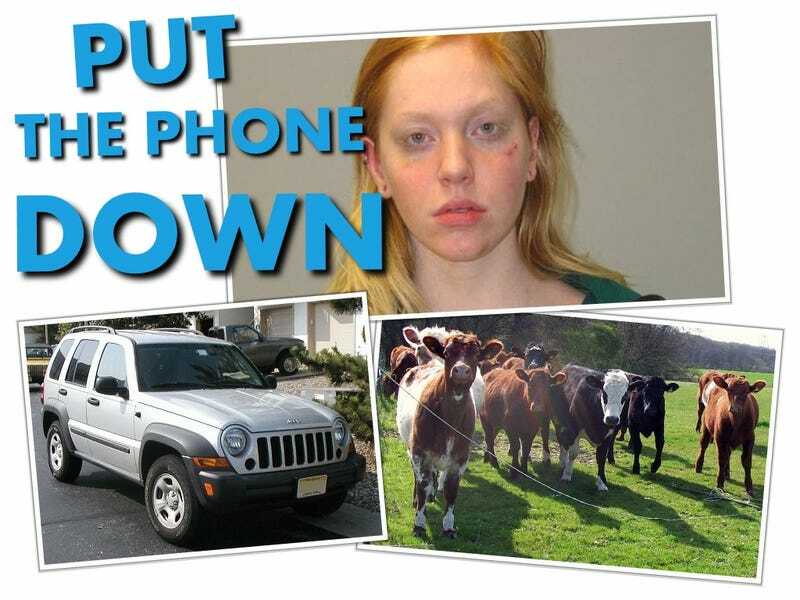 Police have arrested this woman, who was allegedly using her cell phone while driving in New York with a Jeep Liberty. She plowed into a herd of poor, innocent, defenseless cows, hitting six. Three of which were seriously injured and had to undergo surgery, but it looks like they're going to make it. They're going to live. According to authorities, she was using her cell phone at the time of the accident. Having been charged with reckless endangerment, criminal mischief and reckless driving, she also faces charges of driving while using a cell phone and failure to exercise due care. Both traffic infractions, and all of which is definitely uncool. Word on weather Ms. Cowit has a lawyer remains unclear. Also unclear is if any of the cows she hit are named Daisy.